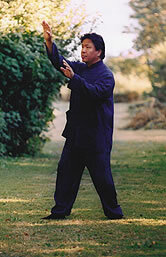 Master Wang has developed seven principles which govern his teaching of tai chi form and search center. 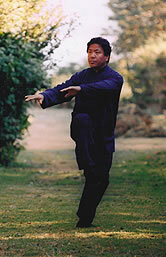 The principles are interdependent and apply to any style of tai chi. 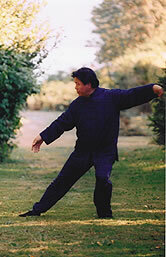 One's center is defined as an imaginary line through the head, spine, dan tien, going to the feet. All movement must originate from the center. If you can imagine a brace and bit you can see how the handle is straight above the drill bit. The center turns allowing the bit to bite into wood. In a similar fashion turning the body's center allows the feet to root into the ground. In Master Wang's principles the center only moves between 100/0% or 50/50% weight distribution. This is in contrast to 70/30% taught by many tai chi schools. Also the center turns first before any shift in weight. After the center turns, the arms and legs follow. Balance must be attained without leaning away from the center. Also the tai chi form should be performed without a lot of up and down movement. Balance allows fluid movement from one position to the next. Often the optimum balance point is at a 45 degree angle or multiple thereof. Balance and center are closely related. When we walk, our body is naturally coordinated. When one's left leg moves forward, one's right arm balances it. 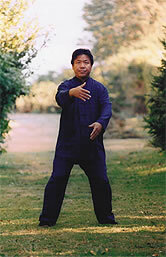 Similarly in the tai chi form there can be no separation of movement. Upper and lower body must move in unison, left side must balance the right. When one's arms are raised the knees descend. When pressure is applied to the right leg, the left arm compensates. The body must move as a unit. 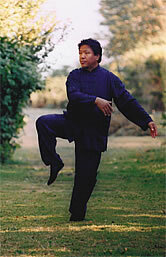 One's tai chi posture should resemble a globe shape with the dan tien as center. The right hand is related to the left foot. The right elbow is related to the left knee. The right shoulder is related to the left hip. During the form, when weight is switched to one leg, the opposite arm responds accordingly. They would be the "yang" leg and arm. One way to test proper positioning is to have a partner push against an arm and see if the chi flow is connected to the opposite foot. The mind must focus on what the body is planning to do. As in meditation the mind must avoid wandering and continue to think about proper movement according to the seven principles. The mind is capable of amazing power if correctly channeled. 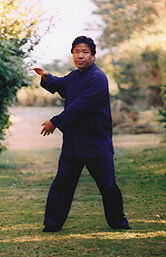 The mind directs the movements in the tai chi form as well as searching a partner's center in search center. 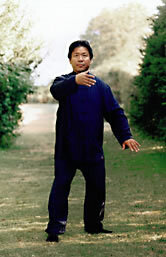 All moves in tai chi are circular and joints are always relaxed, never locked. Circles possess immense power. The center turns in a spiral fashion. The tighter the spiral the more force contained. In search center the body acts like a large ball and incoming forces will "bounce" off it. This spiral energy assists the tai chi player to "connect" and circulate incoming and outgoing chi. The body learns to carry a lot of tension in the muscles, especially in the shoulders. Relaxation is not the same as sleeping or lying on the beach. In tai chi one must use the mind and concentrate on relaxing the muscles and tendons. Also one must allow the body's chi to "sink" towards the ground. Relaxing and sinking the chi increases one's root. Relaxation allows one to "listen" to incoming force and use soft energy to overcome hard.